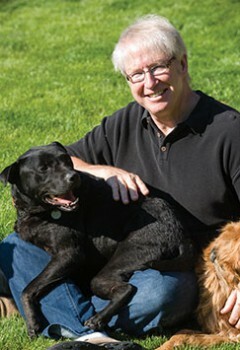 Dr. Marty Becker has spent his life working toward better health for pets and the people who love them. He was the resident veterinary contributor on “Good Morning America” for 17 years, serves on the board of directors of the American Humane Association, and is a founding member of Core Team Oz for “The Dr. Oz Show.” In recent years, his realization that it’s impossible to provide for pets’ physical well-being without equal focus on their emotional well-being led him to found Fear Free. The Beckers live in Northern Idaho with their many adopted pets, including QT Pi, a distemper survivor shelter puppy; their adopted “canine cocktail,” Quixote; Quill’N, a pit bull mix adopted from a veterinary technician program that works with shelter pets in need of medical care; Talley, a hard-luck kitten who joined their family to become their first and so far only house cat; a barn full of adopted community cats; and four horses.